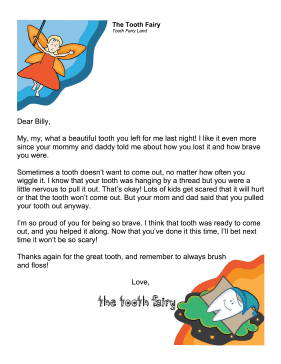 Reward the bravery of a child who pulled a tooth with this printable tooth fairy letter. My, my, what a beautiful tooth you left for me last night! I like it even more since your mommy and daddy told me about how you lost it and how brave you were. Sometimes a tooth doesn't want to come out, no matter how often you wiggle it. I know that your tooth was hanging by a thread but you were a little nervous to pull it out. That's okay! Lots of kids get scared that it will hurt or that the tooth won't come out. But your mom and dad said that you pulled your tooth out anyway. I'm so proud of you for being so brave. I think that tooth was ready to come out, and you helped it along. Now that you've done it this time, I'll bet next time it won't be so scary! Thanks again for the great tooth, and remember to always brush and floss!